68/69 grimsby v burnley football league cup. 69/70 stoke v west brom. 66/67 burnley v stoke city. 67/68 Stoke City v Newcastle. 68/69 reading v Northampton. 60/61 Swindon v colchester. 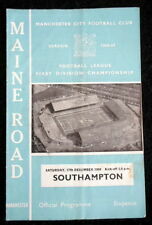 64/65 Southampton v bury. RARE & VINTAGE 30 OFF CLUB FOOTBALL PROGRAMMES 1950's onwards International . All from 50s onwards. 63/64fa cup final preston north end v west ham United. 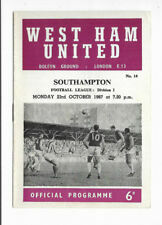 74/75 single sheet fa youth cup west ham united v watford. 65/66 Tottenham v nottingham forest. 64/65 Tottenham v nottingham forest. Manchester City v Southampton 17-12-1966. RARE & VINTAGE 19 OFF MANCHESTER United CLUB FOOTBALL EUROs, Final. MANCHESTER UNITED. 62/63 FA cup final Leicester City v Manchester United. 68/69 Manchester United v Waterford. 68/69 Manchester united v anderlecht. 77/78 Manchester United v st etienne. 66/67 nottingham forest v Manchester united. Played on 23rd sept 1967. 11/1/1961 - MAN CITY V CARDIFF CITY - FA CUP. 2/1/1960 - MAN CITY V SHEFF WED. FOOTBALL LEAGUE - DIVISION 1. 68/69 Tottenham v Southampton. Detailed condition notes above. Slight crease score written on team page. Sent in a card backed envelope. 1969-70 First Division Matchsheet. Everton v Southampton. No hand writing. Bobs Football Programm. WEST HAM UTD. SEASON 1981-1982. 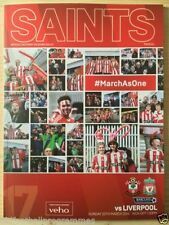 Liverpool v Southampton programme 25th October 1969. 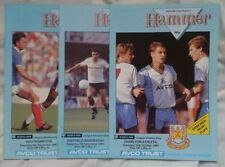 The programme is in good condition with no tears or creases. 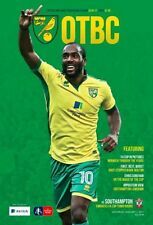 The score and team changes have been written neatly on the back cover.